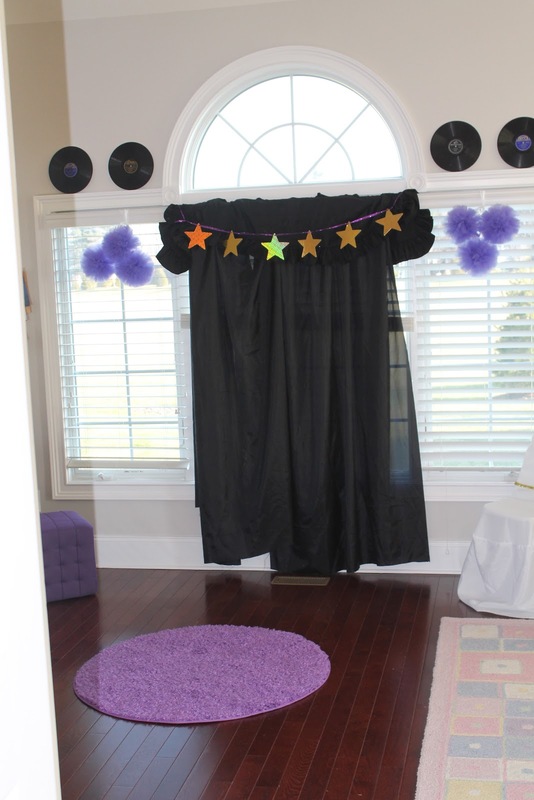 I had the great pleasure of doing this fun pop star themed party this weekend. This party was MADE for birthday girl Mia and her sister, Sarah! Such sweet and talented girls! 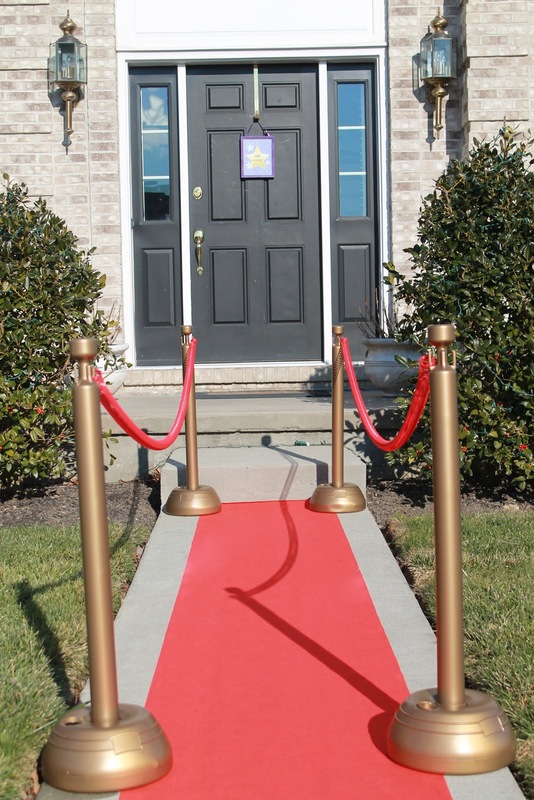 With a mic in hand, I greeted and interviewed each “pop star” on the red carpet as they arrived. The sister of the bday girl video taped each one as I asked them how they felt about being part of the concert and what they had planned on singing for us, etc. It was great. They were so so cute. The mom stood at the door photographing them. They were handed a custom made concert ticket outside (to get in the VIP Entrance) and when they got inside, they also received their VIP backstage pass. Of course, we got plenty of shots of the birthday girl and her sister before the guests arrived. Inside, the table was glamorously set for 15 awesome pop stars. Place card holders were made with mini disco ball ornaments, flat washers (on the bottom) and stars (personalized, cut out, and glued onto tooth pics). 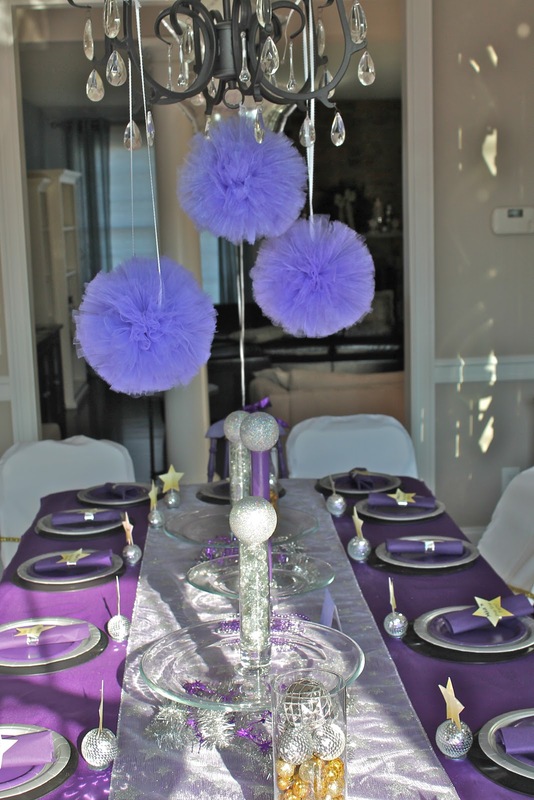 I used a lot of disco balls for decoration, too. 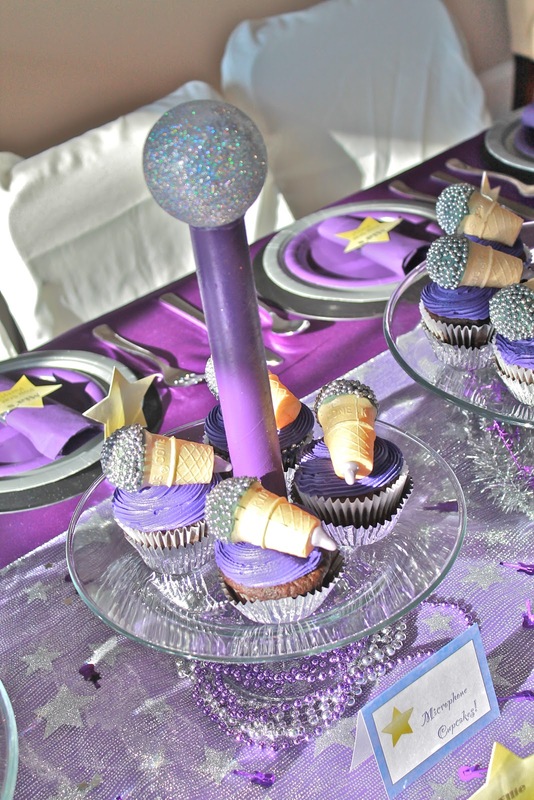 I made “microphones” on the cake plates to match the cupcakes (below) using tall glass vases and filled with glass beads, topped with a glittery Christmas ball. The purple one was a wrapping paper insert I spray painted. Glued a flat washer on the bottom to keep it standing and added a glitter ball on top. Check out these microphone cupcakes! I found the idea on Pinterest and gave to my awesome baker, Kelly Ott of Cannon Classic Cakes/Delaware Desserts. The girls went crazy for them! Is this chair cute or what? Amazing what a can of spray paint can do! 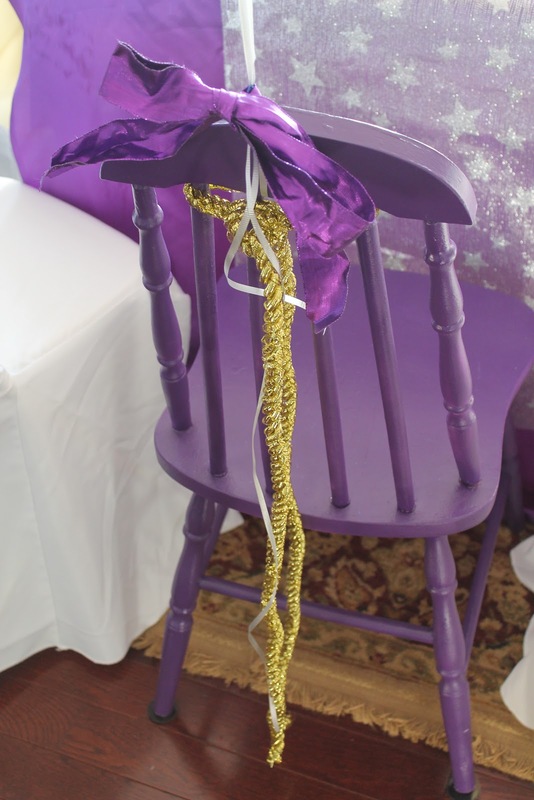 Was so excited to use my fun chair as a special seat for the birthday girl. In the main party room, we did a microphone craft. I pre-made the mics out of toilet paper rolls & glitter balls. Got a lot of use out of that can of spray paint! They were super easy to make. There was a table set up for make-up and props set out for fun. I brought boas and hats and the girls had quite a bit in their own collection to add. Plus all the girls got gold or silver super star shades. A fun thing to do for a party like this is to take some shots the day before the party. I got some great shots of Sarah and Mia signing into the purple mics and printed up for the party. I hung them on the wall along with the prints I made of Katy Perry, Kesha, Ga Ga, etc. They turned out so cute. 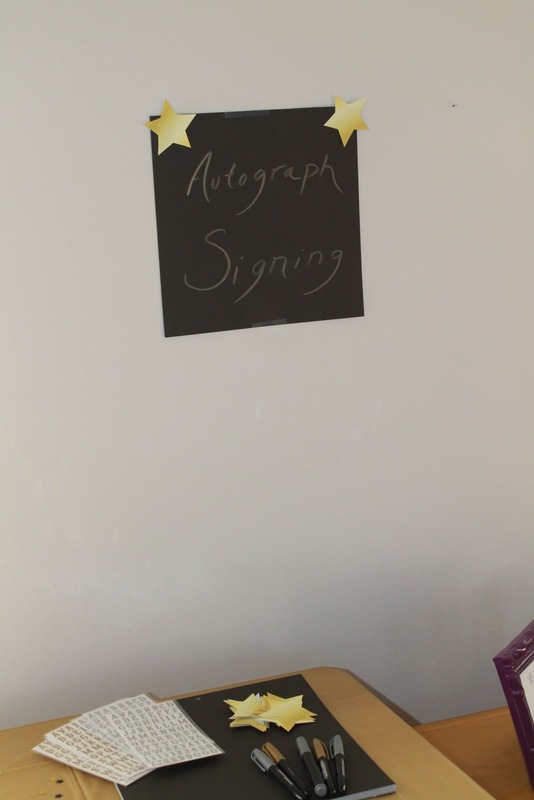 Next up was an autograph session. The girls designed their own scrapbook page, then had all their friends sign it. Of course, the main event was the karaoke. Before, during, and after the crafts. We started out with a dance party then I MC’d it as if it was a concert. I made a mock stage with a round rug and black back drop. This was a great spot for taking photos, too! They danced. They sang. They hammed it up. I enjoyed every minute of it. And I’m pretty sure they did, too! Great, great time with a wonderful group of girls. 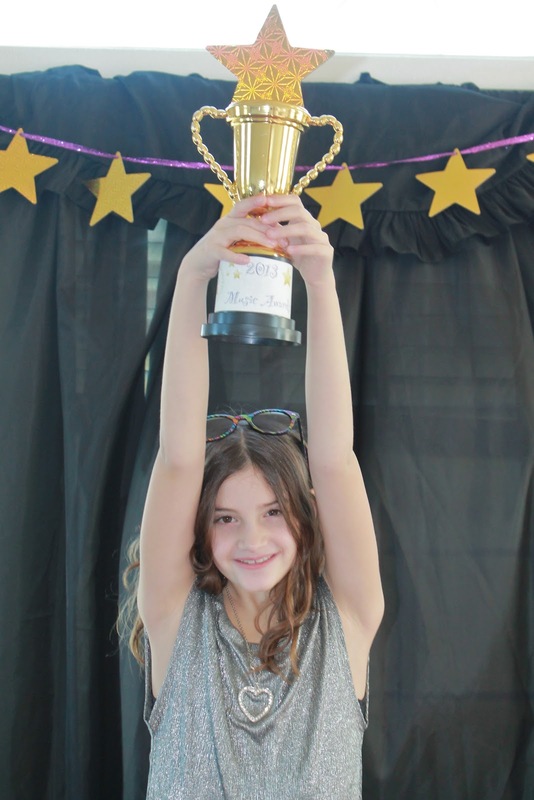 Happy Birthday, Mia, you superstar!!! Visit Pretti Mini’s profile on Pinterest. « Holiday Wrapping Goes GREEN!